It's been said for years that a dog is a man's best friend. Well, how about a game about dogs that everyone can enjoy. Diggity Dogs is a simple game where players try to collect the different items indicated on each dog that they are in need of. The game play is similar to Go Fish since players need to either draw a card or ask other players for what they need. 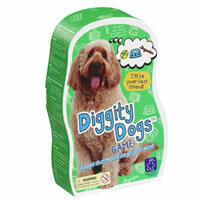 Diggity Dogs includes the whole family and is very easy to learn how to play. The theme of dogs is fun for all those dog lovers and owners out there. You'll be sure to have a fun laid back time playing Diggity Dogs. Learn more below, let us know how you like this game and get your copy today. The winner is the player with the most dogs! You get 7 Stand-up doggy game pieces, 28 cards and the official Diggity Dogs game rules and instructions. Please keep in mind that the official Diggity Dogs childrens rules and instructions could be different depending on the game version you have. The rules below are some of the exact directions on how to play Diggity Dogs. Share with us your comments, funny stories, tips, advice, strategies, creative ways to play, questions about how to play, problems with the rules or anything you want about Diggity Dogs. All submissions will be reviewed within 24 hours. Click here to add your Diggity Dogs comments.